Let's Race with simbaa racer! One of the excellent bike racinggames with extremely smooth controls and best racing motomultiplayer game for real. Realistic motorcycles, attractive 3Dgraphics, challenging bike race with vivid sound and awesomesuperbike characters. You will enjoy this crazy fast racing gamefree multiplayer challenges which make this one of the best drivinggame. 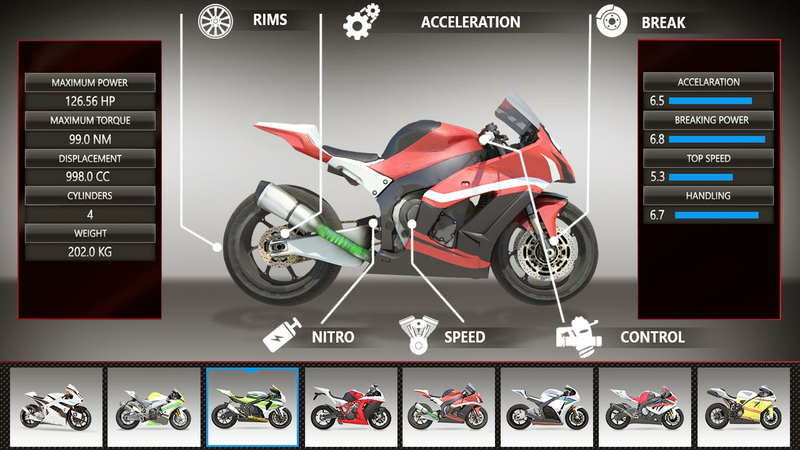 Drive and race the moto in your very own style and avatarwith superfast motorcycles which are awesomely ready for race.Select your crazy avatar - It's super realistic animal streetracing with multiplayer. Go crazy cheering animals racing on streetand win on impossible tracks with your favorite characters. Youshould be aware when need for speed, slow down your monster bikeand become the crazy highway rider to make your highway fantasymore crazy with speed racing. You can select your own racing moto,stunt on highway, overdrive it and make hard cash racing on streetto make it one of the best games. Race with your rivalry in thismultiplayer racing game, racing superbikes in high alert trafficracer area. Avoid crashing and beat your opponents to win the crazymotorcycle race. Are you ready for one of the best free racinggames? Let's Race! Featuring the best mobile racing game - Bus Racing vs TruckRacinggame for Free! It's you with your expert rivals on highwayandrural area to race with you. The one who cross the line firstwillwin the race against your rivals. Enjoy the feeling of beingthebest racer in the world with fast driving skills with greatrivalson fast racing tracks. Stunning graphics and realisticracingtrucks and bus racing model transport vehicles will amazeyou.Challenging circuits, fast tracks on highway, skilled driversandonly one to win the race will keep you on edge during a race.Takedown the competition with extreme truck racing skills againstthebus racing rival . As it's a big wheel race, push yourdrivingskills to win the race and become the best racing gamechampion.Dominate and top the league with your driving skills andbecome newking of racing game. Experience the new thrill racinggameplay withchallenging racing tracks to drive and drift yourtruck. Challengeyour abilities and earn big money. Can you win therace? Join theRace now! Play the best Car Stunt Racing 3D for Free - The ultimate Carracing challenge! Compete against the speed and challenge racingsports car, huge buses, public transport, trucks, muscle cars andmany more to cross the bridge. Take off from the ramp from themountain and land on other part of island or city. Choose yourfavorite racing car to challenge your abilities and kill your fearto stunt from a great height. Crossing the missing bridge and makeit to the other side is not an easy stunt to perform with any car,you would require turbo or super cars which can speed up to maximumwithin seconds. You can find super cars with extraordinary speedincluding turbo engines and road burning heavy wheels. You canboost your car racing engine with nitro button and the car will flyin the air with highest speed but you should use it wisely as it'slimited. You can upgrade your vehicles and perform your car racingstunts better to earn more cash. Get out of that street racing andmultiplayer racing games and try the real car racing stunts to havefun. This car racing game is free to play but it may contain itemsthat can be purchased with real money too. Unlock all hot cars withgreat speed and accuracy to jump off the ramp in style to otherside of the racing street. It's an addictive and most exciting cardriving game with impossible tracks and challenges. World classenvironment with realistic graphics and car features. Can youbecome the next racing legend of Champions Stunt Racing - CS Racing3D? Download and drive your favorite car to stunt like neverbefore. Play now! Switch and match farm pets in this divine puzzle game - FarmDayMatch 3 Games for Free! Plan your moves wisely to help farmerstoearn lots of money. Burst farm baskets through your sweetswitchand match moves to make fruitful farming experience. Becomefarmhero and match as many pets as possible to blow them andearncoins. Take on this deliciously sweet farming match 3 gameandcross hundreds of level in farm day. It's an adventure puzzlegameof match 3 to make best of harvest and play with your friendstohave a great farming. Play the best farm match 3 game andspreadthe sweetness with all your friends!